Oooh look! More knitting! More mittens! 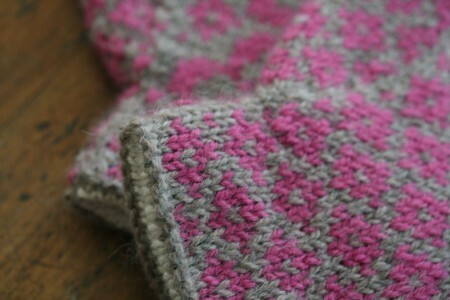 I finished the End of May Mittens on Monday – just after the January NaKniMitMo deadline. The yarn is the Berrocco Ultra Alpaca that I bought at the Wool Basket in Duxbury. I love the raspberry and brownish gray combination. The lining is a bit of Debbie Bliss Cashmerino. 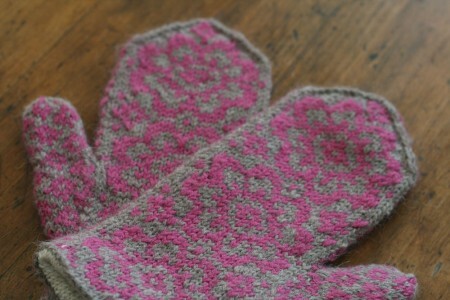 The alpaca and cashmerino together make for incredibly soft mittens. And that is a very very good thing. Especially given a certain ground hog’s prediction this week. so pretty! and I bet that lining is heaven on the hands! Beautiful! I’ve had that pattern in my queue for a while now. Great color combo! Those will be nice and warm. They look very warm, luxurious and beautiful! May your hands be warm and cozy. Wow. So pretty. Love the colours and the lining looks so soft. Love the flower motif. Followed your Ravelry link and discovered the matching hat. Hmmmmm…. My my, aren’t *those* scrumptious! Uhoh, these are pink, too. I’d hide them from Hannah. 🙂 They’re beautiful! Beautiful, beautiful, beautiful. 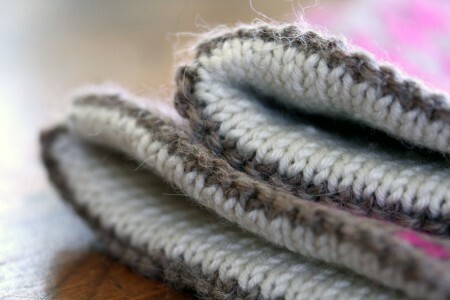 Are you signing on for the Knitting Olympics this winter and, if so, Rav or Harlot? Beautiful! Make sure you get some mittens for yourself too. You’re a knitting machine! Very pretty! They look soft and warm. They look so yummy and soft! I love those! Wonderful color combination. So who gets that pretty pair of mittens? You or your lovely daughter? Another nice pair of mittens. I hope you’re keeping these for yourself to get through the next few weeks. I think we ought to teach that darned groundhog a lesson. 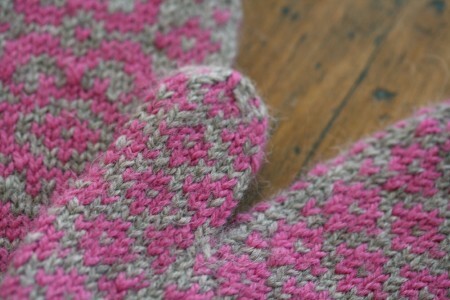 Pretty mittens! They must feel so good on the hands. Oh, what a luxurious combination! I love the colors and yes, it looks like you will still be able to get quite a lot of use out of them. Good job, grrl! These are such cute little luxury hand hugs. Ohhh, Carole, I’m behind in my blog-reading duties, as I’ve been a tad bit BUSY, heh-heh. BUT THESE ARE SO GORGEOUS!!!! Nice! Everytime I see a new pair of these I think I’ve seen my favorite combination. They sound so lux on the hands, too.